Log into Pakki and start planning your studies! plan the pace and the resultant load of your studies. In Pakki, you may also compare the module learning outcomes with the skills and knowledge you already have. If you notice similarities, learn more about the RPL process that relates to the accreditation of prior learning and skills demonstrations. Open a browser and write https://pakki.hamk.fi. We recommend that you use the latest versions of Internet Explorer, Safari, Chrome or Firefox. Log into Pakki with your student id and password (HAMK id and password). Change the language to English from the upper right corner. Log into Pakki with your HAMK id and password. Select Documents from the desktop and New order. The list includes all the documents available in digitally signed format. Select the right document type, language of the document and Order. Select the tab called Documents. The newest document is the first one on the list. Just select the document name to download or open it. open it with a default PDF reader on your computer. Save the document on your computer and forward it e.g. attached to an email. The recipient may validate the authenticity of the document by following the instructions at the end of the digitally signed document. If you notice some errors in some of your documents (e.g. Transcript of Records), please contact studentservices(at)hamk.fi. Up-to-date description of all services available in the app store. 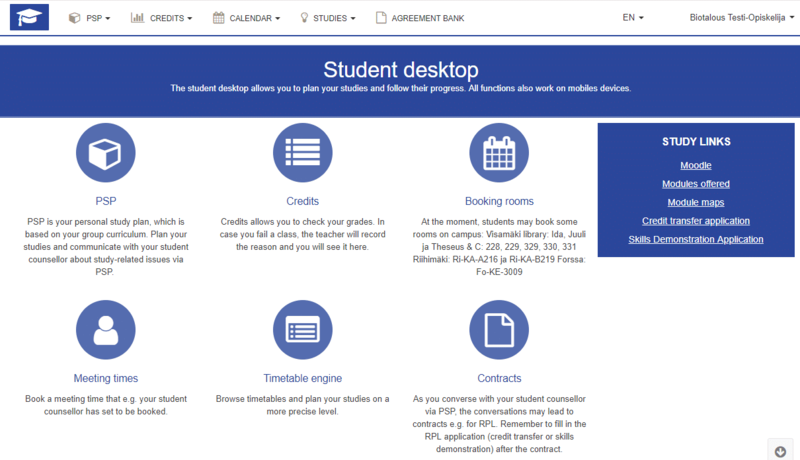 In this tutorial, we will go through the editing of the student’s personal data and profile. The video includes instructions on how to add your profile picture. Please note that the image should be in the png or jpg format and it should not exceed 300 kb or 640×630 pixels. In this video tutorial, we will show you how to enrol on modules in Pakki. In this tutorial, you will learn how to select and add modules to your personal study plan (PSP). In this video tutorial, you will learn how to apply for the recognition and accreditation of your prior learning. In this video tutorial, we will go through the functions related to grades and the transcript of records in Pakki.